of V3 Lacrosse – Coastal Virginia. From Battlefield to Playing Field. All-Pro equipment bags are designed with the same tactical technology that our nation’s heroes depend on to carry their mission-critical gear in the harshest conditions on earth. Just like they do, you rely on your equipment to perform at your best which is why our bags are purpose-built for unprecedented durability and functionality. V3 League Pride Patch Patch. Reinforced bottom and removable back compartment insert for added stability. 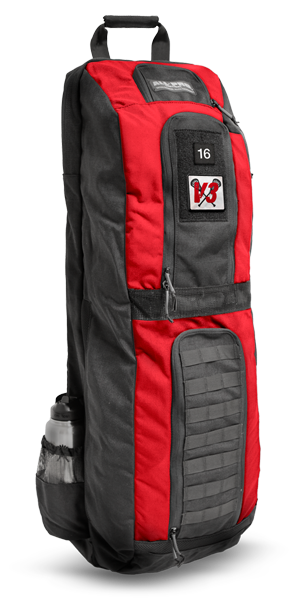 Super-padded adjustable shoulder strap and handle. Side sleeve to holster your stick. Felt-lined top pocket for glasses, goggles, mouth guard and valuables. Waterproof middle pocket for storing wet clothes. Massive main compartment for helmets, pads, cleats, balls and more. Spacer mesh side vents control odor and allow water vapor to escape.